Happy MLK Day, fellow Americans of every race, creed, religion, and persuasion! For those not in the know, or my international visitors, or those who believe today is a frivolous day off, I heartily recommend you fulfill a civic and humanitarian duty: check out the story and the words of a great orator, theologian, and leader of men, Dr. Martin Luther King Jr. He imagined a better world, and I do think the world has become better between the ’60s and today (not that I experienced it first hand), but we have not yet achieved his great Dream. He is a man deserving of memory and memorial, so I urge you to consider today as my employer once urged me to consider it: Today is a day ON, not a day OFF. Yes, they are warships, but they are quiescent warships, vessels far flung from home, awash in the light of a distant sun, and against the grandest of backdrops. 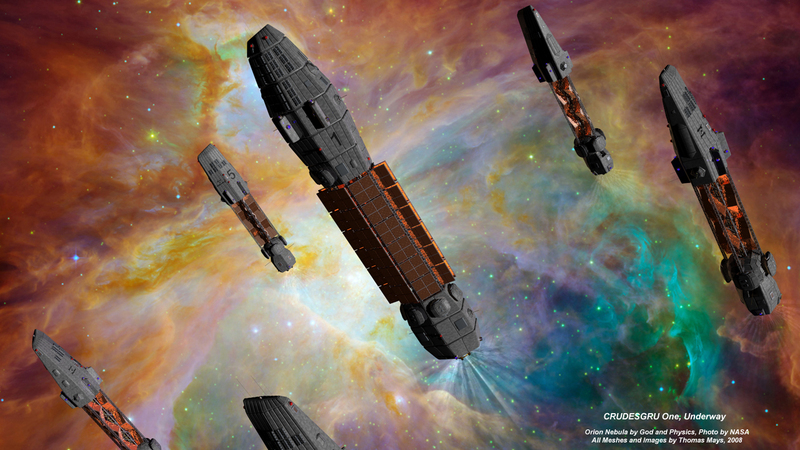 This pic is Cinema 4D again, with the Sword-class destroyers post-refit, and the Trenton in the center. I did steal a little for this pic. The nebula is not of my creation. As I say in the blurb on the pic, that is a product of God and physics, two things that some see in diametric opposition to one another, but which I see as complementary and unified in every important way. The Orion Nebula is beautiful, and I love this pic for the beauty I make use of. These ships are not at war. They cruise in peace, exploring, realizing the dream that generations of men and women before lived and died to make possible. This pic makes me a little happier inside. In other/related news, January 31st is only 11 days and 8-10 blog posts away. That should allow me to put up several more pics, wax rhapsodic about the book, let you peek into my mind, and also offer you a chance to win a copy. What can you do? Keep visiting, keep sharing it with your friends and on your blogs, re-post, re-tweet, and forward The Improbable Author to all your sci-fi lovin’ friends and family. Remember, I am after your beer money, but I also think I’m giving you a great experience in return. So share the wealth and see you tomorrow! This entry was tagged A Sword Into Darkness, God's grace, Military science fiction, MLK Day, science fiction, self publishing, Stealth Books, writing. Bookmark the permalink.